Someone said there was monster trucks and stuff here. Er, I must a taken a wrong turn back at Albuquerque! That's my primary criteria before trying any new lotion. Well, that and the question, "am I allergic to it?" Organically raised ingredients are good as well, but I can live without them. Now you know the other reasons I don't wear make-up. (sigh) Sometimes it's annoying to try to live by ones principles. And Nathan, when I worked in a bio lab, all the guys used hand lotion. If you didn't, then your skin would flake off as you washed your hands every thirty minutes. So they make plenty of lotions without foofy smells. My wife makes her own, thanks. Michelle, I honestly don't know. I think I may have to find out, though. I love a good lotion - but if the scent gets too strong it makes me sneezy. I'll have to try it! I wear very little makeup as well - Burt's Bees lip gloss and tinted moisturizer - because it's organic and not tested on animals. Besides that - how much makeup do I need to walk downstairs and sit down in my home office next to my dogs? Jeri, I don't wear much makeup on a daily basis, either, for the same reasons. But about a year ago, I did go to an esthetician and had my makeup "done." It occurred to me that I hadn't really changed my makeup in about 100 years, so I had them do something more age appropriate. So now when I do wear makeup, I wear more than I used to, and it looks like I wear less. Gotta love the professionals. Where do you find an "esthetician"? I was a tomboy so I *never* learned to put on makeup, and always feel stupid if I try to wear it. And all these discussions made me realize that all my makeup is REALLY old and needs to be thrown away. Not that I'm using it right now or anything. But still. If the shelf life of makeup is 6 to 12 months, then everything has been expired for an embarassingly long time. Like maybe since my wedding. Michelle, I found my esthetician at an Aveda spa, but most day spas have them on staff. You can make an appointment, and they can teach you how to put on makeup, and make suggestions on skin care, too. Stores like Sephora also have "make-up artists" on staff, but in my experience, those folks don't have the training that a certified esthetician has, and they also tend to apply the makeup with a trowel (and it looks like it). As I mentioned before, the gal who did mine applied more product than I was using previously, but when she was done, it looked like I was wearing less, and as a result, I looked younger. The entire at home process takes me less than ten minutes, including the skin care regime. Heh. Now may I introduce the "guy stuff" and tell you all how this goo is made? John, I really think I'd prefer you didn't. Nope, just operating under the "ignorance is bliss" principle. I really like this stuff, and I don't want to know how it's made. LaLaLaLaLaLaLaLa! I can't hear you! Hmmm... I wonder what the odds are that I could find something like that around here. And John the Scientist: it's only a problem if you think eating bugs is squicky, yes? Michelle - no, I was not referring to bugs, but porcine and equine proteins. I only know of a few lipsticks (mostly cheap Chinese stuff- go figure) that still use the chocineal dye - nowadays most reds don't come from bug shells. I'm thinking more of glycerins and gelatins. "From what I observed, the two rendering plants I have seen over the years weren't too careful about segregating their, uh, raw material. As one crusty plant engineer said to me, "Bones is bones". :-)"
Arrgh - cochineal - I always flip the "h" to the wrong "c". Bugs is bugs, right? Ick. I'd rather eat bugs. Of course the fact I wear lipstick about once a year makes me feel a little better. Okay. This brand at least is vegetarian. Whew! And no bugs in my house. Cats eat 'em. And it's not like they can't use agar instead of gelatin. I'm going to run away now. I've checked the ingrediant list on my fabu lotion, and nothing appears to be ground up critters. But then, I'm not a chemist. Michelle, you'll be happy to know Aveda's products are "all natural," whatever that means. Michelle - if everyone used agar, then you'd suddenly find the price of agar-based products going through the roof - there isn't enough manufacturing capacity to meet the demand, and likely algae and seaweed stocks would be significantly impacted too. Cochineal dye is "all natural". Mmmmm, porcine proteins. Yeah, after a 4 month stint at an industrial hog farm, (don't ask) I can no longer feed my cats "junk" or cheap cat food. Because I know EXACTLY what goes into that food, and I love my cats too much to make them eat what is technically waste. Human grade ingredients only people. I don't even want to think about what I'm putting on my face. Edited to add: should be a comma after only - because punctuation is our friend. I've been using Aveda for years. First because it wasn't tested on animals (my primary criteria) and then because I can recognize most of the things on the ingredient list as reasonable. I just last night ordered some new make-up from Origin, which seems to have the same principles as Aveda. And I'm trying a bunch of different lotions that are organically produced and not tested on animals. Unfortunately, not that excited about them right now, with the except of the "Be Fine" stuff. I know they've already been harvest, but that doesn't mean I want to eat them! Michelle, I like Aveda products, too. 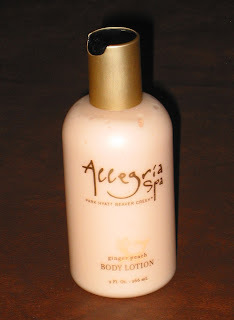 I just liked this lotion when I tried it. I'm looking into the animal testing thing for this product, as well. Janiece and Michelle - everything, and I do mean everything, that you buy cosmetic-wise has been tested on animals at one point. ""As far as we know," says Neil Wilcox, D.V.M., director of FDA's Office of Animal Care and Use, "what these companies do is use, for the most part, old reliable ingredients that have been proven safe [based on past animal data and a history of safe use] and then test the final product on people." "
If you have a product that says that it has not been tested on animals, that is becuase all of the ingredients therein are GRAS - Generally Regarded As Safe - meaning that the record of safe long term human use obviates the need for new human testing - but nothing can be classified as GRAS without animal testing in its past history - especially carcinogenicity testing. With the exception of animals that test the stuff you stick in your eye, these animals live well. The rats get a patch of hair shaved and the goo slathered on for their entire lives, and when they die they get an autopsy to ensure that the cuase of death was not cancer. They are fed and cared for better than most pets (becuase there is an economic incetive to do so - rats dead from mistreatment mean a failed experiment, and Sprague-Dawleys are EXPENSIVE - because they are guaranteed disease free: if you start with sick rats, how do you know if it was your cosmetic that caused the sickenss or if the rat was already sick?).
" "There's kind of a fine point here," says CTFA's McEwen. "These companies that say they don't test on animals are skirting the issue. Practically every ingredient that's used in cosmetics was at some point tested on animals. Probably a statement like 'no new animal testing' would be more accurate." "
Interesting - thanks for the link, John. I find I can live with the idea of "no new animal testing." I want my products to be safe, and not cause me or my family disease. Me too. Let's be rational - I value human health over animal health, but I'm not needlessly cruel, either. I sort of subscribe to the American Indian ethos that if you scarifice the animal you use it all as a tribute to its life, which, kidding aside - is why I like the idea of using ossein to make Jell-O and cosmetics. But I do think that marketers are being disingenuous when they make the clain "no animal testing". I want to beat on them the way my wife beats on her buddhist brother: "oh, you won't kill the animal yourself, but you'll eat meat becuase the butcher is already going to Hell? You...you..." then some burst of Chinese expetives. John, I hear you. Hypocrisy gets under my skin. I'm a buddhist, but not a very good one - I'll eat meat, and make no moral differentiation between me and the butcher. Re GRAS--that's the very point. No new testing is being done. And that's just fine with me. But there's treated well, and there's treated well. I used to work in a lab (I worked for NIOSH) and I'd have to help one of the researches change the cages for mice. So I know first hand what the conditions were like. No, of course the animals weren't mistreated! But... sterile environment (Literally. Everything was autoclaved). No stimulation. Sure plenty of food and water, but they're kept in shoe box sized cages with only a couple of litter mates for company and entertainment. Yes, when human lives are at stake, animal research must be done. Hell I am currently on prescription medication and thus the beneficiary of animal testing. But I think it's going a little far to say these animals are treated well. I certainly would not want to have to live under similar human sized conditions. "But I think it's going a little far to say these animals are treated well. I certainly would not want to have to live under similar human sized conditions." Point taken. I have lived in similar human sized conditions - i.e. Tokyo, and it's not fun. Their preventative veterinary health care is better than for your average sewer rat, though.